US live sports and entertainment group Madison Square Garden Company (MSG) has submitted a planning application for its proposed new venue in London, with an array of eye-catching technology features part of the proposal. The plans for MSG Sphere have been lodged with the London Legacy Development Corporation (LLDC), as MSG seeks to develop its first major venue outside of the United States. Located in the heart of Stratford, East London, MSG Sphere’s main venue would have a scalable capacity of up to 17,500 seated, or 21,500 when there is a mix of seated and standing. The latter, in theory, would be greater than the official capacity of The O2, the nearby arena operated by MSG’s rival AEG. 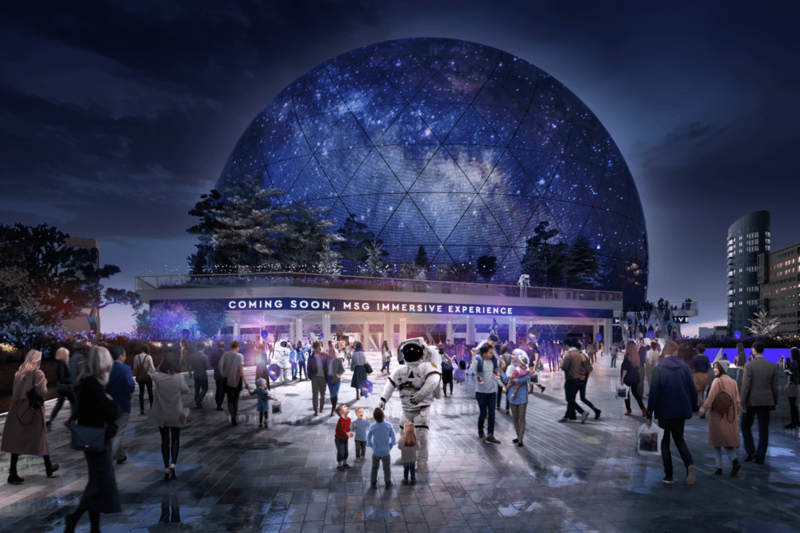 Featuring a spherical shape, the privately-funded MSG Sphere would have a diameter of 120 metres and, at its highest point, would be 90 metres tall. The venue would be wrapped in triangular LED panels which, when active, will showcase a range of static and moving images including digital art, content related to current and future events in the venue, and advertising and partnership branding. MSG said the venue’s cutting-edge technologies would enable the creation of immersive experiences that “completely transport audiences”. These technologies include the largest and highest resolution LED screen in the world and an adaptive acoustics system that will seek to deliver “crystal-clear audio” to every guest, no matter the size or type of event. A haptic flooring system will be installed which will convey bass through the floor so that the audience can “feel” the experience, while the venue will be provided with wireless connectivity that delivers 25 megabits per second for every guest. MSG has already purchased the 4.7-acre Stratford site, which has been left empty for more than six years after last being used as a temporary coach park during the 2012 Olympic and Paralympic Games. Jayne McGivern, MSG’s executive vice-president of development and construction, said: “This is an opportunity to take an inaccessible coach park and use it to support thousands of jobs, and billions of pounds of economic benefit. MSG said analysis from economic consultancies EY and Volterra shows that, if approved, MSG Sphere would support up to 3,200 jobs each year across the UK once it’s open and up to 4,300 jobs each year during the three-year construction period. EY also estimates that, once open, MSG Sphere would generate £2.7bn (€3.16bn/$3.56bn) in positive UK economic impact (GVA) over a 20-year period – £2.5bn of that in London. This includes more than £50m in revenue every year for local businesses in Newham. In addition to the main venue, the plans for MSG Sphere feature a smaller music club/nightclub, retail space, a café, and restaurants. The project also includes landscaped publicly-accessible outdoor spaces, including an urban square, park space, nature play space for children, seating areas and an outdoor gym. The London venue is part of MSG’s wider MSG Sphere masterplan. 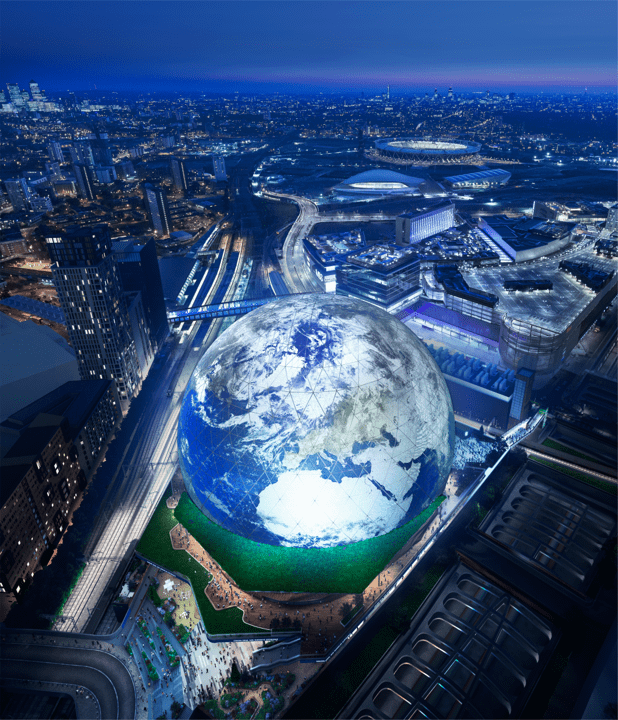 The company has previously announced that it will also build an MSG Sphere venue in Las Vegas – MSG Sphere at The Venetian.